Make your sausage the day before you want to use it so that the seasonings and wine will have time to infuse the pork with flavor. 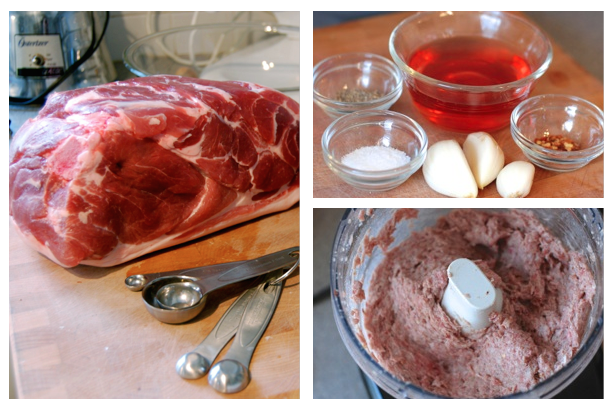 Cut the pork shoulder into 1/2″ chunks. In a food processor mince the garlic, salt, pepper and chilies. Add the pork shoulder and pulse to chop. When finely chopped, process at full speed and drizzle in the wine. Blend until the sausage is sticky looking and the fat has begun to emulsify with the wine. Refrigerate for 24 hours. Can be eaten fresh within a week or frozen.